Over the weekend, Science Blog reported new guidelines for pet CPR that every dog owner should be aware of. For nearly 50 years, the American Heart Association, with the help of researchers and physicians from across the nation, has developed and disseminated guidelines on how best to perform cardiopulmonary resuscitation on patients experiencing cardiac arrest. But no such evidence-based guidelines existed in the veterinary world. Perhaps as a result, while more than 20 percent of human patients who suffer cardiac arrests in the hospital survive to go home to their families, the equivalent figure for dogs and cats is less than 6 percent. Now the Reassessment Campaign on Veterinary Resuscitation, or RECOVER, a collaborative effort of the American College of Veterinary Emergency and Critical Care and the Veterinary Emergency and Critical Care Society, has arrived at the first evidence-based recommendations to resuscitate dogs and cats in cardiac arrest. The Journal of Veterinary Emergency and Critical Care has published a series of articles that outline the new guidelines. Perform 100-120 chest compressions per minute of one-third to one-half of the chest width, with the animal lying on its side. Ventilate intubated dogs and cats at a rate of 10 breaths per minute, or at a compression to ventilation ratio of 30 to 2 for mouth-to-snout ventilation. Perform CPR in 2-minute cycles, switching the “compressor” each cycle. Administer vasopressors every 3–5 minutes during CPR. Using the new guidelines, the RECOVER team is developing an Internet-based training curriculum to certify clinicians in veterinary CPR. This certification is being peer-reviewed by the American College of Veterinary Emergency and Critical Care, much as the training materials for human CPR are accredited by the American Heart Association. The guidelines will be updated regularly, with the next RECOVER planned for 2017. Chest compression techniques for medium, large, and giant breed dogs. (A) For most dogs, it is reasonable to do chest compressions over the widest portion of the chest to maximally employ the thoracic pump theory. Either left or right lateral recumbency are acceptable. (B) In keel-chested (ie, deep, narrow chested) dogs like greyhounds, it is reasonable to do chest compressions with the hands directly over the heart to employ the cardiac pump theory, again in either recumbency. (C) For barrel-chested dogs like English Bulldogs, sternal compressions directly over the heart with the patient in dorsal recumbency may be considered to employ the cardiac pump mechanism. Chest compression techniques for small dogs and cats. 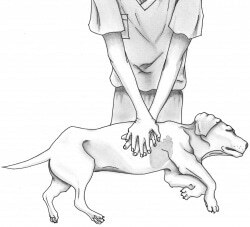 (A) For most cats and small dogs (<10 kg) with compliant chests, the use of a 1-handed technique to accomplish circumferential chest compressions with the hand wrapped around the sternum directly over the heart may be considered. (B) An alternative chest compression method for cats and small dogs is the 2-handed technique directly over the heart to employ the cardiac pump mechanism. This method may be considered in larger cats and small dogs with lower thoracic compliance, or in situations in which the compressor is becoming fatigued while doing 1-handed compressions. There is strong evidence, including an experimental study in dogs documenting increased rates of ROSC and 24-hour survival, supporting a recommendation for compression rates of 100–120/min in cats and dogs (I-A). However, there is also some evidence that higher compression rates of up to 150/min may be even more advantageous, and further work in this area is needed. There is also good evidence to support deep chest compressions of 1/3–1/2 the width of the thorax in most patients (IIa-A), with an experimental canine study showing a linear relationship between compression depth and mean arterial pressure, and multiple human clinical trials and experimental animal studies supporting these compression depths. [37-39] Finally, experimental studies in pigs have documented reduced coronary and cerebral perfusion when full elastic recoil between chest compressions is not permitted (ie, leaning). Observational studies in people have shown a high prevalence of leaning during CPR. It is recommended that full chest wall recoil is allowed between compressions.